Totally Tots: TOTally Working for Me ~ Keep em' Out! Celebrating YOUR Tot ~ Last call for May Tots! Tot Food ~ What's on YOUR Tot's Plate? TOTally Working for Me ~ Keep em' Out! Did You Know ~ What do YOU Want to Know? My 20 month old twin boys have become quite a handful! They seem to get into EVERYTHING! In particular, they always want to take their clothes out of their dresser and throw them all over their room. I didn't really want to spend money on those little latches that you can attach to the drawers. The next best thing I could come up with was a yardstick. 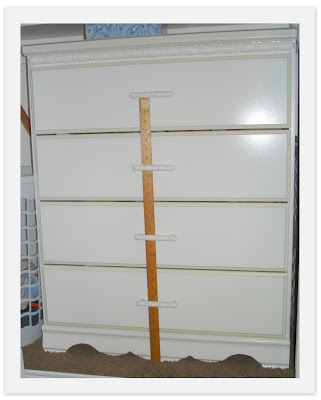 I took a yardstick and I slid it through all the handles of the dresser drawers. Now, they can't get into the dresser and their clothes stay in the drawers! This TOTally Working for Me post was written by Jennifer. You can visit Jennifer at Mama Jenn . Thanks Jennifer for the great tip! Do you have something that is working for you and your tot? We'd love to hear about it! We have a dresser next to our china hutch, brilliant idea. Now I can finally use the bottom drawers! This makes me giggle. But what a great idea! Great idea!! Luckily, my twins dresser has drawers that are "stuck" and really hard to open. I suppose if they worked together, they could get them open, but, for now, they can't get in. It seems like every day they are learning ways to get into various other things and I look forward to any other ideas you find that work. Thanks!!! i am definitely doing this. My daughter won't stay out of her drawers. She keeps taking everything SINGLE thing out and stacking it in a pile on the floor saying "i made a cake". this is a great idea.